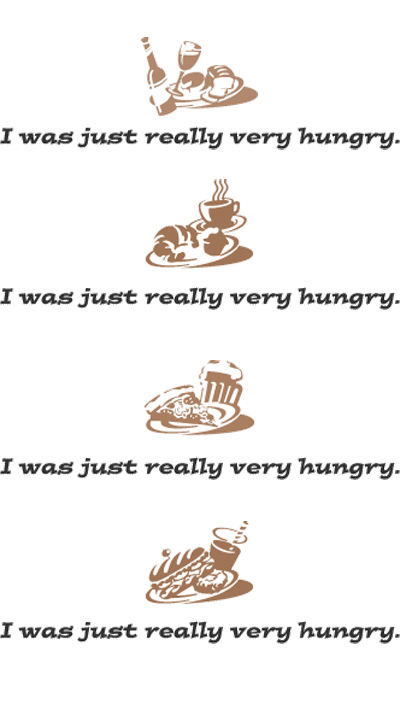 The header graphic of the 2nd design of Just Hungry displayed one of these 4 illustrations at random. As I wrote yesterday, when I started Just Hungry I had no plans at all about the theme of the site, other than it would be about food. I think that you could get away with that back then, when the number of actual food blogs was probably still in the low hundreds. The focus of this site has evolved in a rather meandering way, and it is now mainly about Japanese home cooking, healthy eating, and the occasional food related travel report. This was as much guided by what site readers seemed to want to read here, as much was what I wanted to write about. In my regular eating life, I don't just cook and eat Japanese food, and I confess I don't always eat healthily either! But in general, I've found that when I stray from my main themes too much, reader numbers tend to go down. Since I do enjoy writing about the themes that people seem to like reading, that's really fine with me. Nowadays there are probably thousands of blogs dedicated to food, and if you are starting a new food blog and want to built up a reader base, you probably want to focus on something specific that would garner attention. Indeed I think the reason why Just Bento has grown much faster than Just Hungry did in its early years is that the focus is much narrower. (The traffic numbers for Just Hungry are still nearly 2 times that of Just Bento on average, but Just Bento has more RSS feed readers already.) Two of the most successful food blogs out there that I admire greatly and were in existence when Just Hungry started out, Simply Recipes and Chocolate & Zucchini, have always been quite focused, which I think accounts for their popularity to a great extent. Still, I am quite happy to have Just Hungry remain quite general in its focus, because it gives me the freedom to go off on a tangent if I want to. It's an outlet for me as much as anything else. For instance, I stopped doing detailed episode recaps of Top Chef after seasons 1 and 2, when I realized that the recap posts were attracting the wrong kind of attention (as in, a disproportionate share of trolls). I was quite put off talking much about food-related TV shows after that. But when I found a show I really enjoyed recently on BBC, Supersize Me, I felt like doing detailed recaps again and quite enjoyed them - and this time, perhaps because it was about food history, not a reality show, they didn't attract trolldom! And while I may write mostly about Japanese food or good-for-you food, I can occasionally bust out and write about something loaded with, say, butter and bacon. (I'm thinking bacon-chocolate-chip-cookies, what do you think?) That's the beauty of having your very own stage, or blog, to shout from. Please check the giveaway rules in the first post. Do try to remember to keep it to one comment per item/entry, thanks! (I've noticed that sometimes people seem to get impatient and post the same comment twice. I use a spam-preventing tool called Mollom, which sometimes can cause a short delay between the time your comment is entered and the time it appears. So please wait a bit before submitting another comment.) Remember: You need to give me your email address (in the email entry area) where I can contact you if you win, your name (or nickname), and your location (country). Today's giveaway is my favorite cookbook by far in English, The Way To Cook by Julia Child. It's the one I turn to for recipes that work. As you might expect from the great lady Julia Child, it has lots of standard French recipes, but it also has a lot of great American classics like Boston Baked Beans, New England Boiled Dinner, and more. Published in 1989, it is timeless and classic, with beautiful photographs and clear, easy to follow recipes. (I wrote about my love for this book two years ago, and my feelings about it now are exactly the same.) It's sure to become a much-loved book in your kitchen too. Please note this book has standard U.S. measurements in cups, ounces and so on. This giveaway is now closed. Thank you for participating! The winner will be announced next week. Check out the front page for the open giveaways you can still enter! Submitted by maki on 2008-12-03 18:19. Oops, sorry, not sure what happened here. Have you read "Julie and Julia"? What am I saying, I'm sure you have. Have yet to find "The Art of French Cooking" but I keep looking at thrift stores. I love your posts. That happend to me on yestarday comments and posted two... sorry!!! I love Julia Child (and also Top Chef, I must admit)! I went to the renovated American History Museum this weekend and they had an exhibit about Julia Child's kitchen... which I think was Julia's actual kitchen that she designed personally in the later years of her life, or at least a reproduction of it. The part that everyone loved was how she had mounted pegboard all over her walls in order to hang kitchen utensils, pots and pans, etc. Brilliant! And it was so funny to see pictures of Julia in earlier kitchens, namely when she lived in Paris -- she towered over this tiny, tiny stove. Julia Child is an inspiration. I always wanted one of her books. I like your blog because it is about Japanese food from an expat perspective. It's very hard to get ingredients where I am, even by mail, since the postal system is shady. I like looking at the Japanese cooking magazines online to drool at them but I can't get half of the vegetables and ingredients they talk about. Ooh, this is a good one! I enjoy your general interest posts too, and I actually looked forward to the Supersizers posts (since I can't watch them here). Keep it up! She is a great chef and cracks me up with her silly antics at the same time!! I hope I win! "if you are starting a new food blog and want to built up a reader base, you probably want to focus on something specific that would garner attention." Julia Child Rocks! I would love to own one of her books! I used to love watching Julia Child on PBS (and thanks to you I got ahold of "Supersize Me" and just loved it. Love the site - love the cookbook! i've been meaning to buy this since you mentioned it last summer in a post about cookbooks... so i'm in! it's really nice the way you managed to have a very focused foodblog and a more general one. i have become an affectionate reader of both, and i appreciate their differencies! Growing up, I would sit with my grandmother and watch countless reruns of Julia Child, and seeing that book brings it all back. Thank you for the reminder of fond memories and your amazing site which I have been with for years. Happy Anniversary to Just Hungry too! I think people sometimes forget about how amazing Julia is/was, and get wrapped up in all sorts of fads and cool new food trends. She really is amazing. Oh my goodness, I remember watching Julia Child as a kid on PBS. What a blast from the past. Her cooking was always so awesome - she was capable of very extravagant cooking to scraping the bottom of the fridge and still coming up with something delicious. That's a book I'd love to have. I've heard really good things about it. The classics! I am way too intimidated by real cooks/chefs, but I would love to own something so biblical. I've never cooked any of Julia's recipes, but would love to start now! oh what a great prize! oh what a great prize! i've been looking for one of julia's books to get and if i don't win, i may just have to add this one to my Christmas list! Growing up, I remember watching her TV program with my Grandmother. I remember commenting to Nana that Julia could hold her wine well and Nana laughing. When I was very young, my older brother used to do Julia Child impressions, even though neither of us really knew who she was. But it was side-splittingly funny. Now that I'm older and cooking all the time, it's been fun to use her cooking genius with that voice in my head. Looks like a great cookbook. Always good to have the classic cooks on hand. I too love Julia Child. I have MTAOFC but not The Way to Cook (which sounds a lot more reasonable, based on what you've written). Emi from CA again :) This book sounds awesome. My parents have a copy of this book and I often like to browse it when I am back there for the holidays. It's a great resource, and a Julia Child recipe has never failed me. Julia was a quite a character. So funny and loved to cook. I remember watching her shows and didn't had any idea who she was (I always missed the intro). I adore Julia Child and surprisingly this is one cookbook I don't own (I currently have over 85). heard about julia child but never actually tried!! now im excited to try after reading what you wrote! I love the older cookery books. Becaused I'm mostly vegan, I find all the newer ones are convinced that we have access to endless supplies of specialst foods. For those of us outside the USA, things like Seiten are hard to find... I often find I get better recipes from older, ohmniverous books than I do from the vegan ones! i love julia child. she's so amazing! i don't know why i don't have one of her cookbooks... i need to fix that! Way to go 5 years. I found you because of your Japanese cooking content, but I've stuck around because it is all so good. I love the books you're picking for the giveaways. I hope I win one! I like the fact that your blog is about general topics. That way I can use it to find information about everything. It's great! Do you have any Julia Child remakes that would be suitable for bentos? I live in the USA. oh my goodness! bacon chocolate chip cookies were always something I wanted to try making, but the blog with the recipe I had my eye on went down =( and of course, I'm too much of a coward to try making my own without a recipe to guide my way. Will you be making your own cookies, or writing about them in general? I've always wanted this book! i love julia child! i have her baking book and a cookbook collaboration between her and jacques pepin. and what a great gift. I recently finished reading the book Julie & Julia, where this blogger wrote about cooking through a book of Julia Child's French recipe book in 365 days. Mmm, Julia Child recipes are absolutely classic. Love it! I just love her TV personality, I can only imagine how great/crazy she was in person. Would love the book. I love your recaps of the BBC's Supersize Me! I don't have cable and thus don't get to see the show, but it doesn't really matter b/c reading your recaps is so much fun! Argh! Forgot to mention that I'm in the US! I've not heard of Julia Child before but after reading your review and all the comments here.. woh ! I am missing out something here ! Hope to get the book ! Thanks for all the great give-aways !! That story, "I really was very hungry" by MK Fisher was just on the selected shorts podcast. It's such a lovely banquet. Julia Childs has my vote. Can I win? I just read the Julie/Julia novel, which chronicles the journey of a cook who decides to make all of the recipes in Mastering the Art of French Cooking by Julia Child in one year! I actually enjoy when you stray from the usual stuff. Looking back through older posts, some of the non-Japanese and non-healthy stuff is really good! If you ever started another food blog (which would be crazy) I would vote for cookbook/recipe reviews and some kind of daily-dinner report. Thanks again for everything so far! There's one and ONLY Julia Child! As much as I love Japanese food, I also enjoy the occasional tangents on Just Hungry. Hooray for 5 years! I'm one of the people who mostly just looks at Just Bento myself. I have always wanted to get one of her books. I remember watching her cooking show as a child. I just bought Julie and Julia, the book about the woman who tries you Julia Child's cooking. I read the first page on the way home where Julia Child's husband wrote about his wife's newfound love(?)/obsession(?) and I am so excited for the two of them... and to immerse myself! btw - if Julia's kitchen is still at the Smithsonian, it's SOOOO COOOOOL! Knoxville, TN, USA - if my username-link didn't tell you enough. I really liked the original title of this blog! Yeah, to be quite frank, the title sounded somewhat convoluted for a blog - and interesting because of that. Just hungry seems practical but I always think of it as I was just really very hungry. If it's your favorite book, it must be good so I'd love to win! I'm in the U.S. Thank you for the giveaway! I remember watching her on television before school started. I love watching reruns of Julia Child. She always seems a bit tipsy. Count me in - I adore Julia! Julia Child is 10,000 kinds of awesome. Julia Child!!!! I want I want!!!! If I win, this will be my first J.Child book!!! Thanks for organizing this giveaway! it's great to have a story behind the cookbook you are offering, your relationship with it... thank you for that. sorry if I posted twice the other day. I don't know Julia's recipes but always keen to find a new favourite cookbook. Wouldn't it be lovely to win that book. Thanks for a most enjoyable blog and many inspirations. Julia Child really is the doyenne of TV Chefs isn't she? I remember watching her as a small child, who could forget that voice! Congrats on your 5th anniversary. I often wish there were more than 24 hours in a day so that I had enough time to get things done. When I don't have time to read blogs, at least I content myself with seeing some of the wonderful pictures on yours. I guess there's a true meaning in "a picture is like a thousand words". And Julia Child is the essence of modern cooking! Julia Child was just amazing. I stumbled across both JH and JB after moving (temporarily!) to Japan, but it's been great to get your perspective on Japanese cooking. Not to mention that it's a breeze to find the ingredients here! I'd love to have Ms. Child's book. I don't have BBC, or even a TV, but I did enjoy your "Supersize Me" write-ups. Very interesting. If this is your favorite cookbook, it must be a really good one ! Thank you for your blogs !!! Would so love a copy of this book! I am in the US. ohh more to learn from !!!! You have picked lovely items for the give aways! The book sounds so good to read and look at. I'd love to get a copy! I like your blog, btw. :) It's fun to browse through new recipes. Thanks for giving away your things to readers! Your blog has been a great source of recipes and inspiration since I first discovered it last year. The focus on healthy, Japanese food suits my expat life in Beijing perfectly. All the ingredients are easily available at local supermarkets, the recipes are simply and easy to follow, and all are super tasty! Here's to many more blog posts to come. One day in the coming year I'm determined to visit The Smithsonian Institution so I can visit Julia Child's transplanted kitchen. She gave me confidence to try cooking all those decades ago. And MFK Fischer. And Marguerite Patten. I must admit, I have never heard of Julia Child, but since you seem to regard her so highly I am very interested in seeing what she has to offer! Julia Child is brilliant. I'm in the USA, waiting for my new cookbook. boo to trolls! play nice in other people's houses/blogs! I've read so much about Julia Child, but somehow have never actually read anything she's written. Now, even if I don't win the draw giveaway, I'll be sure to look one up! That's one of the things I love about this blog; it inspires me to try new things in my cooking life. 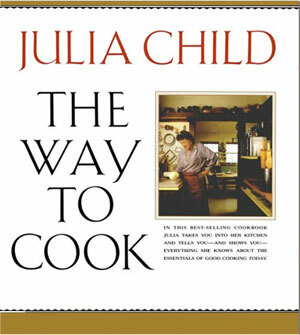 i would love to get a copy of Julia Child's book! I am so interested in learning about classic cooking styles, and Julia was such a master! I would love this cookbook! I would love to have a copy of this book. Thanks for the bento and giveaways! Not good for the diet, but yummy and I'd love a copy. New Zealand. I love the other books of hers I have... this is already on my "must get" list. I've just read The Tenth Muse, which is the autobiography of Julia Child's editor for Mastering the Art of French Cooking. It's a great read and it got me interested in Child and in classical French cuisine, which was totally over my head before! I've only read Mastering the Art of French Cooking, but that's a real standby for me. I'd love to check this one out too. And the BBC show you mentioned looks interesting, I'll definitely check that out. I would love to read and use that book! you know, I started reading this blog because of the top chef recaps (I think it came up in a search), but I can understand why they stopped. And I'm definitely happy I've kept reading. Thanks! My roommate has a Julia Child book, and I love using it! Try her baguettes-it's my alltime favorite recipe. I've never read any of her books but heard good things about them. I guess the occasional comments I leave on your blog are soon enough after the posts that I haven't seen troll comments. Or either they were happening before I found your blog. I used to see Julia on shows when I was a young teen, and she kind of scared me back then LOL, little did I know how great she was until I was older. I, too, used to watch her show, with my mother. At the time I didn't care much, but I KNOW a lot of it rubbed off on me! I love the inventiveness of her flavor palette, and this really does work...it's quite good. Peanut butter and bacon pizza, too. There is a place in Oakland, California where I used to order peanut butter and bacon pizza--the peanut butter is subbed for the sauce, white cheddar and mozzarella for the cheese, then bacon and carmellized onions on top. If you think in terms of the use of peanuts in Thai food, it's not so weird! Anyway, thanks for all the great information, and for doing this wonderful series of giveaways! I would be honored to win. Thanks for all of your hard work. Julia Child rocks my life. i love julia and jacques cooking show. I am a huge lover of cookbooks, but for some reason I don't have this one! did you know she went to europe as a spy in her younger years? A classic, and I've never even looked through it - count me in! Need some inspiration here in Edinburgh! The French Chef was the first cookbook I bought myself - must have been 1975-76. I don't have this one, so add me to the list! I have always meant to have a cookbook of hers! I've been wanting to pick this up so I might as well enter and see if I get lucky! Love Julia Child, and love your site as well! I used to watch Julia's cooking show with my grandmother when I was a child on PBS. I am mostly a reader of Just Bento, but I like to visit here too. Which certainly proofs your theory about the tighter focus. What I like especially about both your blogs is that even though they are in English, which is perfectly fine with me, they are not US-centric. Because of the difference in measurements for recipes is it sometimes hard to follow pure US blogs. Also that you are always aware on how it might be hard to get some specific ingredients. The blog is yours to do with as you want. Try not to be too discouraged if occasionally readership drops a little. It's like the tides... they come and go. I always enjoy yours posts! A Julia Child book would be fantastic--! I had the chance to meet Julia Child several years ago, right around her 90th birthday, and she was such an amazing person! ...it would be healthier but what would be the point in eating it? - a paraphrase of Julia Child. I love cookbooks with great collections of basic recipes. I have some typically swiss, some typically asian, but a typically english/american one would fill an existing lack in my cooking library. Julia Child is great. I would love to check this book out. read Julie & Julia. It's wonderful. i'm always looking for new cookbooks! You've always helped me with the hungry problem. My name is Gina of Tampa, FL, USA. I'll send you something back as a thank you. Julia Child is my hero! what was the word - ureshii? nihongo wakarimasen so luckily your blog is in english - as your entries are so enjoyable. lately nostalgic for me, bringing back memories of childhood bento (packed in wax paper and paper sacks tho - mom would only let us take the metal boxes on special days). also she and I would watch Julia Child on tv together, and that I think is when I started to think of cooking as more than a chore. thanks for your blog, congratulations on your anniversary! please enter me in this one too, thanks! I remember watching her on PBS and wondering if that was really her voice or just her "TV voice." This is another great giveaway item--thanks!